General philosophical meanderings. Things that I learn along the way and think could be useful to someone. In truth it's things that I think of that I will forget in a few minutes - in short a scratch pad version of my mind. I haven't said anything controversial lately and I'm starting to itch. The very popular and free dating site OKCupid is run by a bunch of geeks who like to analyze data. Sometimes that analysis is insightful and other times it's just plain silly. Who says iPhone users get laid more than droid users? Of course a mindless drone will end up on their back more than someone who wants to discuss the meaning of life. So recently the folks over there at OKCupid decided to start pouring over the self-submitted data to see what "stuff white people want". Yes, that is the real working title. Now keep in mind that this data is not their opinion, it's just analysis of what people put on their own profiles. So if the words "Fried chicken" shows up on the profiles of people who identify themselves of a certain race then it's noted. Not saying there's anything wrong with fried chicken or that a certain type of person eats it more than others - It's just an example. Their research is somewhat interesting as it commonly is but what caught my eye is a bit controversial. It also factors into something I read in Richard Dawkins' "The God Delusion". He said that 90% of all Nobel prize winners are atheist. Ninety percent of the intellectually elite don't believe in a higher power! I'd written it off as a side effect of them being scientists and people who try to base their opinions on fact don't believe in the flying spaghetti monster either. Anyway curious. 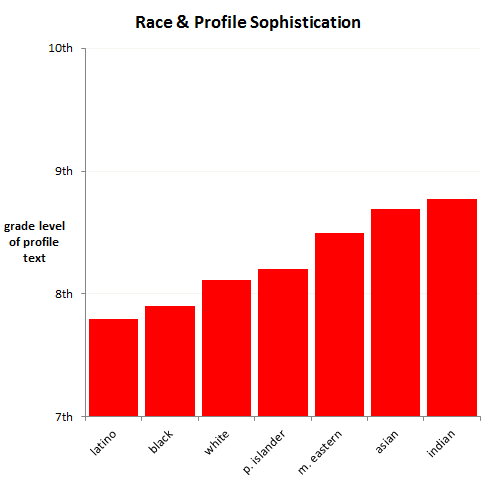 OKCupid made me think of that book by running 250,000 profiles through the Coleman-Liau Index reading test to gauge the reading (really writing) level of people and cross reference it with their self-associated race and religion. You might as well get out the torches now because you know it's going to be bad. To the right is an image from their study showing who speaks and writes English the best in their profiles. East India is the largest English speaking country on earth by population. The next time I mention that I can't understand Dell tech support maybe it's they that can't understand my poor English. The "Asian" category was next. China is the second largest English speaking country on earth according to population so maybe that factors in. Followed by Middle Easterners and Pacific Islanders which means the guy driving your taxi and selling you roasted bananas may speak English better than you. There we are third from last place only beating out Latinos and blacks. You might think "white" wouldn't be a very good category for race because Germans are white and they don't speak English but the majority of the patrons to this website are largely North American thus white means native English speaking Americans and Canadians. It gets worse. They then ran the test on the same 250,000 profiles and charted based on self-associated religious beliefs. Atheists took top honors followed by Buddhists, Jews and Agnostics. Hindu and Muslims took the next spots which is also hinted to in the previous chart. It's curious how poor the Christian religions did though. Do Christians really have the lowest reading level of any major religions? Again maybe the atheists put their faith in science and as a result are better educated. It's anybody's guess really as I'm sure more data would have to be collect ed. The third and last chart that I'll show breaks down religion one step further. On OKCupid you have a choice of religion to identify with and how serious you are about it. You'll see people say Catholic and Serious about it or Hindu and laughing about it. OKCupid took these numbers and again cross referenced them with the results of the aforementioned Coleman-Liau Index and created yet another chart. 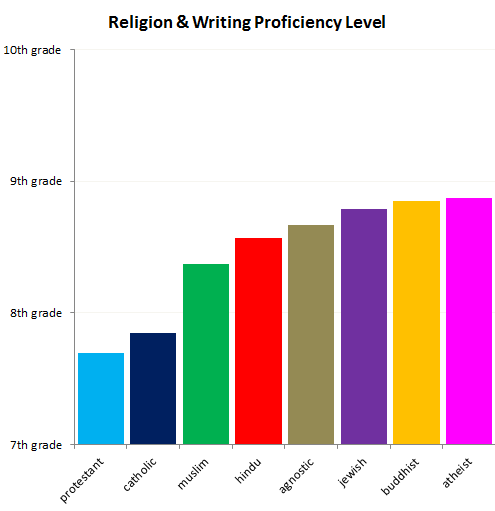 This one showing the reading/writing levels along with how serious people were about their religion. This is very interesting to me because a lot of people will associate with the religion they were raised with. A Catholic that hasn't been in a church in 30 years may still say he's Catholic. With this extra bit of information we might get closer to seeing who's really religious and cross referencing that with their reading/writing level. If you're fuming yet you can stop. This is all mostly for fun and to create conversation. The data is real but it's probably not a good idea to read into it too much. Besides when you put your profile together you have to keep your intended audience in mind. If you're looking for a blond bimbo to stand in for your blow up doll with a slow leak you're probably not going to fill your profile with big words and abstract thought. Hey!... Is that a torch in your hand? So here we are. Buddhists who are not serious about their religion scored the highest where as serious Buddhists fell behind Agnostics and Atheists. Actually the people of each religion who are the most serious about their beliefs consistently scored lower than those who were not that serious. That's the most interesting thing. The more religious someone is the lower their reading/writing level. Maybe it's the other way around and those who can't read and write as well are as a result more religious. I'm sure you could twist this any way you want but it's interesting none the less. What's also interesting is if you observe the non-faith based belief systems you see something different. With Agnostics and Atheists their reading level goes up if they're serious over their not so serious counterparts. What does this mean? Maybe serious Atheists and Agnostics hit the books harder than those holding doubts? 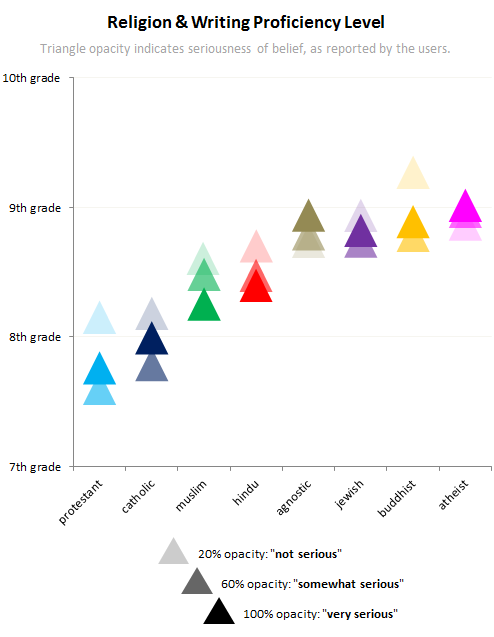 It's also interesting to notice that as the reading level goes down the variation between serious and not serious is greater and as the reading level goes up the variation is smaller. In the cast of the Atheists there's very little difference between the reading level of a serious Atheist and one not so serious. Overall though the non-faith based belief systems scored higher than their faith based counterparts bringing me back to the statistic of the Nobel prize winners being predominantly Atheist. Without making this more controversial than it already is I wonder if the difference is not intelligence (that would be way to disruptive) but rather those who believe in a higher power also put the burden of improving their corner of the universe on that higher power. For example, if people believe they are going to heaven then maybe they'd not spend as much time with education here on earth. If you don't believe there's anything more then maybe you'd maximize your time on earth. It's only a guess though but sort of makes sense. I used to associate with a religion that discouraged getting higher education because their main purpose was to go door to door to spread the word of God. What good is that master's degree but to make more money which buys nothing but earthly pleasures? This also brings up another question, are Atheists and Agnostics more greedy then since there's no heaven waiting for them? This data doesn't cover any of that but reading The God Delusion may be of interest to you. Random is a category of stuff that doesn't really fit anywhere else. Sometimes it's things I think up, other times it's stuff I find that I want to share.. For now it's mostly empty..